Tham & Videgård Arkitekter have completed this curving nursery school located between a forest and former industrial estate in Stockholm, Sweden. Called Tellus Nursery School, the kidney-shaped building curls around a courtyard sheltering the main entrance. 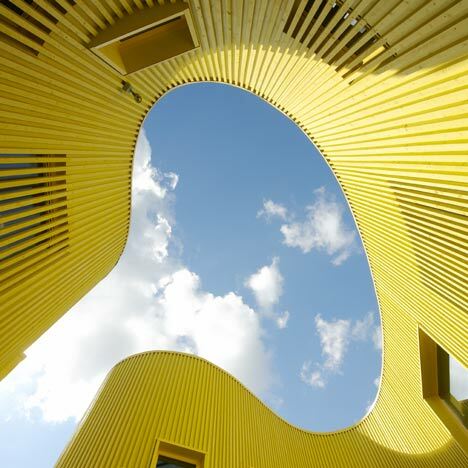 Bright yellow wooden batons clad the facade and partially cover some of the windows to filter sunlight. A large hall inside accommodates six groups of children around various activities, while separate rooms provide space for art projects, quiet areas and play rooms. Photographs are by Åke E:son Lindman. On the border between a former urban/industrial development and a small forest where new housing is being developed, this nursery school mediates between different contexts and scales. A semi enclosed entrance courtyard constitutes a first exterior space for parents and children meeting and leaving. The organic layout encourages movement as space becomes continuous and creates both exterior and interior rooms of challenging shapes. Windows are freely placed at different heights and allow for light and views to be adapted also to the scale of children, which further the relation between the interior and the exterior play ground and the wooded hill. Together with the client and the pedagogues’ inspiration from the Reggio Emilia school, a new way to organize the interior was developed. The result is a rather unorthodox plan, where instead of a complete ’flat’ for each group of children, there will be a large common interior plaza where the six groups can interact around different activities, playing and learning projects. This main space is complemented with separate atelier spaces for water projects and art, as well as small secluded group rooms for rest and quiet activities. The facade panel, made of 50x50mm sawn wood, filters direct sunlight into the nursery school and create hidden windows that underscores the curved interior and exterior spaces. The building complies with the highest standards for environmentally friendly and long term sound construction. Name of the project: Tellus Nursery school. Collaborators: Mårten Nettelbladt, Johan Björkholm, Karolina Nyström, Marcus Andrén, Julia Schönbrunn, Andreas Helgesson.